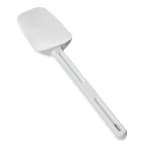 The Rubbermaid FG193800WHT spatula is 16.5 inches long and the blade is molded onto the handle to reduce buildup of bacteria and dirt. The Clean-Rest™ feature prevents the blade from touching countertops, reducing cross-contamination. This spatula helps the user scrape, spoon, and spread product.